About seven months ago, we set out on an ambitious, some might say crazy, endeavor at IMPACT. We decided we were going to throw out our three-year-old daily blog notification email in favor of an email newsletter delivered just three days a week, that curated our content and was handwritten (or eh, typed, in this case). This would dramatically impact our email traffic, shift our workloads, and alter our interaction with our audience -- but we like to live dangerously. But Wait, Why The Change? “As we move into our new position as a media company and publisher, we’re sharing even more killer content and news... each day, but we know that can be hard to keep up with and sift through. We developed THE LATEST as a more meaningful and valuable way to share content with our audience, rather than just an automated email. It goes beyond new articles to incorporate new videos, podcasts, tools and templates, live and on-demand webinars, info and highlights of industry events, and exclusive content only subscribers can have access to. Plus, all of this is delivered with unique insights and context so readers can grasp the full scope of the story even if they’re just skimming. We knew this was a risk. We were pulling back our presence in inboxes and essentially creating a situation where people may not give us their click, but we were okay with this. THE LATEST was born with the goal of creating a better, more helpful experience for our readers; to delight them; to build a more personal bond with them. Traffic, at this point, was irrelevant. Flash forward and as of today, our director of web and interactive content, Liz Murphy, and I have sent a total of 129 issues of THE LATEST with this in mind. While in essence newsletters sound like a no-brainer (fewer emails, only the best content, etc. ), we learned that they’re really not everyone’s cup of tea, mainly because of bad experiences in the past. Last month, I shared a poll in IMPACT Elite and uncovered that 83% of respondents don’t subscribe to newsletters because they already have too much email, while the remainder said they get no value out of them. “I get so much email that unless it's a client....I'm very, very selective now of the newsletters I join.” - Chris B. “So tired of all of the email….I have gone back to the rule if I don’t know you personally or have received a personal referral I am deleting you.” - Susan G. P.
“I think newsletters, when relevant and well done, are powerful to us as users. Unfortunately, I also get newsletters that aren't great - like some that have 50+ resources in them every week. Give me enough, but not too many, make it readable and engaging.” - Dan M.
Clearly, a few bad newsletters ruined it for the rest of us. To some, this may have seemed like a red flag to abort our mission, but this feedback actually taught us a lot about what we should and shouldn’t be doing. It’s email marketing best practice to send your messages from an individual, not from a company name, but this lesson goes a bit farther than that. It’s not enough to put your face and name on an email newsletter, you need to put some of your heart, unique perspective, and voice into it -- perhaps even some of your personal life depending on your brand. And I can say the same. People don’t want to open emails from cold, robotic organizations. They want them from people they’d actually enjoy talking to; people like them; individuals who think and feel, both fail and succeed, and aren’t just full of sales pitches. Our most successful issues of THE LATEST and frankly, the newsletters we love the most, all do this effortlessly. They connected on a more human, personal level. Do you know what’s one of the most effective ways to connect with someone on a more human level? Humor. 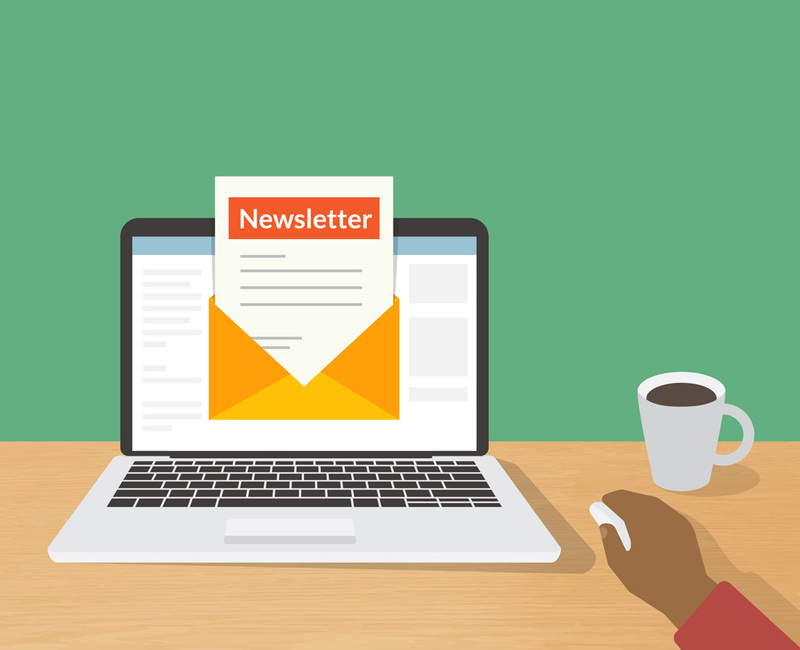 Everyone loves to laugh, so when it comes to newsletters, humor can be one of your most powerful tools. Cracking a joke or using playful language creates a sense of comfort and approachability and shows your personality. It, again, humanizes your brand and make people enjoy (and be more willing to listen to) what you have to say. We usually capitalized on humor using GIFs and hidden easter eggs, but we also try to get playful with our segments. Take Weekend Nonsense, for example. In every Saturday issue, we share a random piece of content (not always marketing related) that made us laugh or put a smile on our faces. Now, while we’ve won plenty of people over with this humor and of course, our content, there are always some who decide we’re not for them. Like any company, we have our share of un-subscriptions and, to help us understand why, we ask for feedback on our unsubscribe form. Some responses are vague saying “the content just wasn’t what I was looking for” or that “they get too much email as is,” but then there are people who go into detail. For example, one person remarked how, when we first launched the newsletter, we included featured images for each article and that ever since we removed them, he felt like the emails appeared disorganized and hard to digest, so he unsubscribed. While we never like losing a subscriber and we definitely understood his point, as marketers, we had to let this go. We can’t make everyone happy. We made this specific change after a long test of including images versus not including them and finding that the variation without images got more engagement from readers. So, we solved for the majority. Unfortunately, this has to happen a lot in marketing. Most businesses are limited in how much personalization and customization they can offer and have to default to what performs best for the majority of their audience and we are no different. When we initially created THE LATEST, we had to make a lot of assumptions and decisions based on what we knew about our audience and other successful newsletters, but this kind of approach should only ever be a starting off point. Once we had a process and template in place, we started testing everything about the email -- images, as mentioned earlier, subject lines, link colors, and headline lengths among other things. This has and will continue to help us more effectively deliver something our audience enjoys and, likely in turn, improve its performance. With all of the technology available to us today, via HubSpot, Optimizely, and other tools, there are no excuses not to be experimenting with your email as a marketer. I know it seems like a lifetime since Tom Hanks and Meg Ryan starred in You’ve Got Mail and email got its first real mainstream exposure (it’s been 21 years, to be exact), but the medium is still alive and well. While, like blogging and social media, email has become saturated with spam, it can still be effective when done right. The key is to respect your audiences and their attention. THE LATEST is not perfect, but by testing, showing a little heart and humor, and overall, respecting our audience’s inboxes, we will get a little bit closer with every issue. 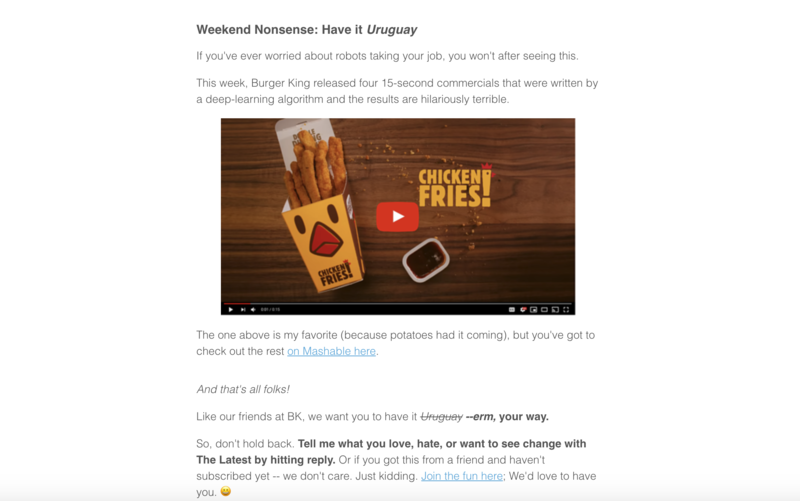 How do you feel about email marketing newsletters? Does your brand or organization say them? Do you enjoy subscribing them? Let us know your thoughts in IMPACT Elite!